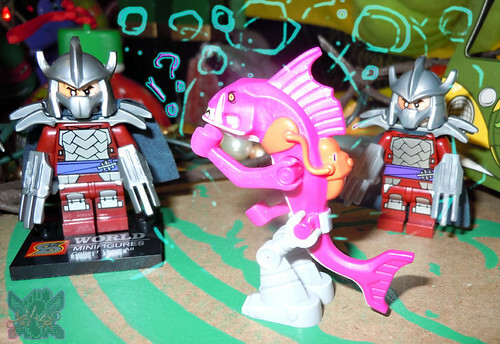 –>> What, the Kraang are cloning LEGOs now ?? 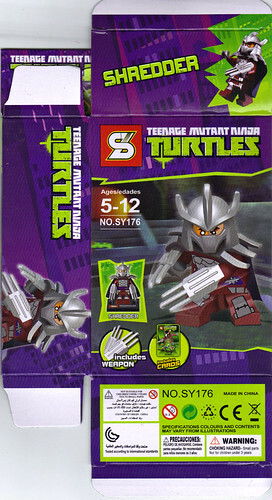 Examining one of the infamous bootleg TMNT LEGO ( BootLEGO ) products – Sheng Yuan’s version of the Teens legendary enemy; The Shredder. 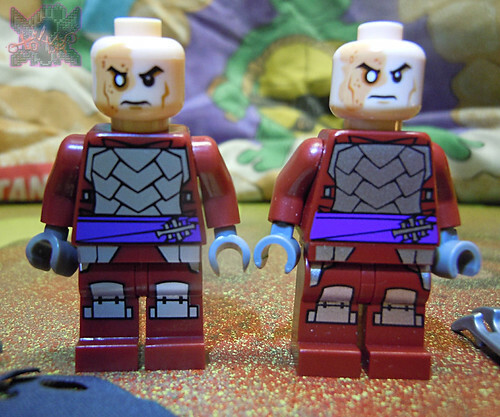 Bootlegs are always of questionable quality; quality-control in general is out the window. 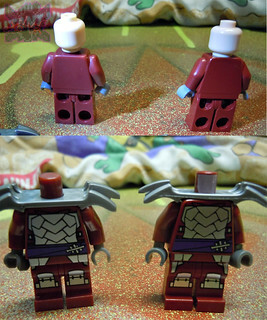 This being my first Brick-toy related knockoff; i shall say that S.Y.’s is of &quot;passable&quot; quality. 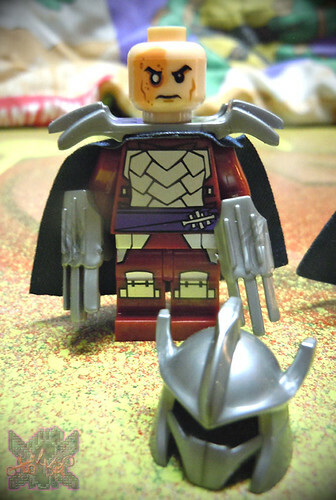 Not the high-standards of a LEGO mini-figure however. 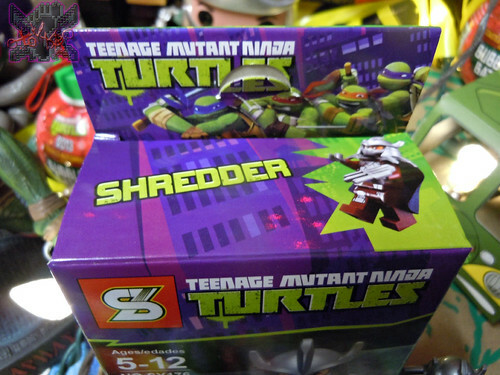 Still for a knockoff; at first it might fool the casual collector that this was an actual LEGO Shredder. 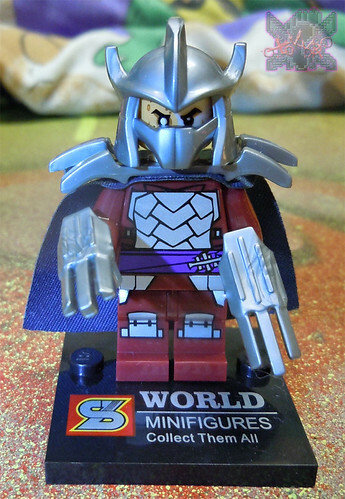 But with bolder black-outlines on the chest and leg parts, slight face variations on the head, and NO official LEGO brand markings on items like Shredder’s hand claws, the cape is softer than the original release, and the hand claw blades are wider. After a bit – it’s really easy to tell you have a counterfeit. 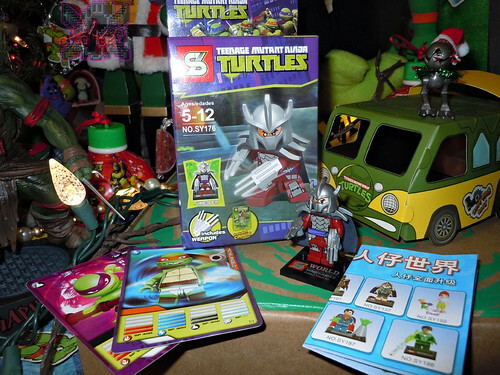 Bootleg toy collecting is a whole other arena and i only have a handful of fake TMNT products. 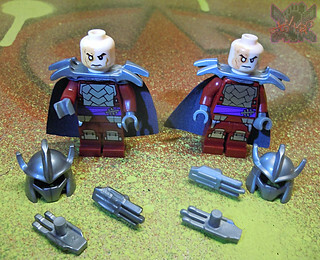 Online LEGO fakes can sell for pretty inexpensive prices. 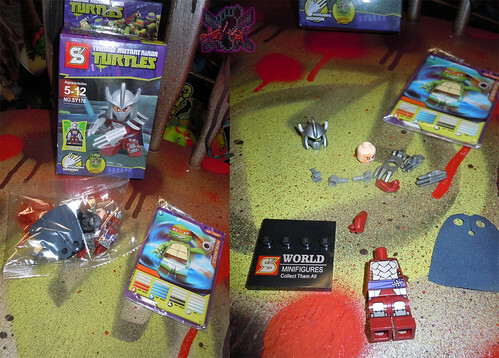 In this case – – a brick-and-mortar store ( or the like) , i did have to pay 10 bucks for the whole mini-set. 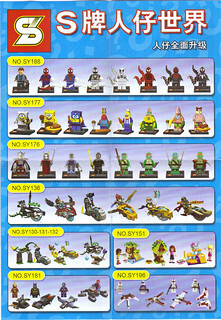 That’s even more than many official LEGO polybag offerings. But i did know what i was purchasing. It’s interesting in these cases vintage or modern; one pays MORE money for an unlicensed and unofficial FAKE product than they would for the actual Licensed product. 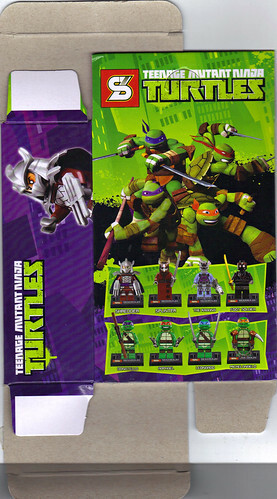 With ALMOST official looking and colourful packaging these brick toys are ALMOST like the real thing. 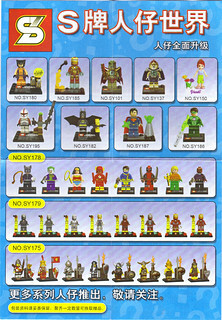 I can understand tho’; outside the BOOTLEG-NERD in Tokka clamoring for more SIMPLY BECAUSE because these are Sooooo fake – a poorer kid or parent purchasing these at a lower price as a substitute toy. 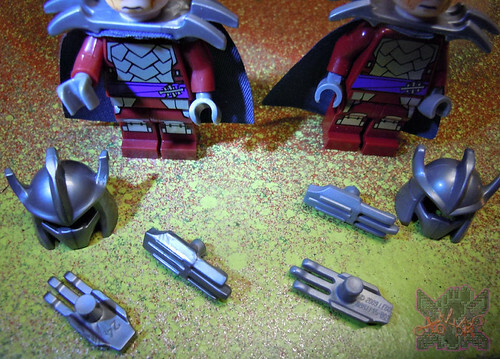 For in some instances Official LEGO products might be TOO expensive. 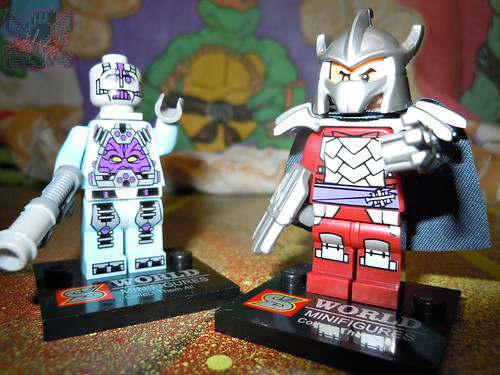 Some collectors also collect the knockoff equivalent of various exclusives minis offered by LEGO such as Con-exclusives that post their initial offering at a convention ..their prices will SKY-ROCKET come a third-party seller offering them. That is if the U.S. Customs or an equivalent agency office doesn’t confiscate them first. 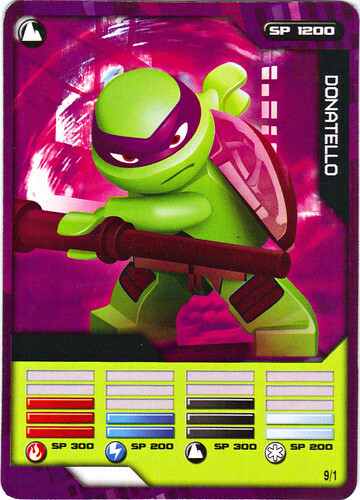 Bright, colourful and dynamic LEGO graphics almost makes you think this is an actual LEGO box. 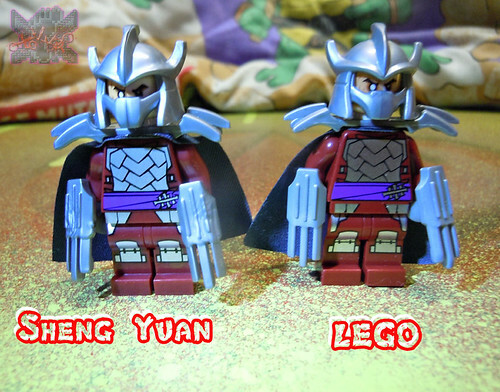 But that’s the point, the Sheng Yuan logo totally gives it away. The randomly packed brochure shows the vast collection of Sheng Yuan’s bootleg-brick empire. Very interesting. I presume all the game cards are randomly packed. 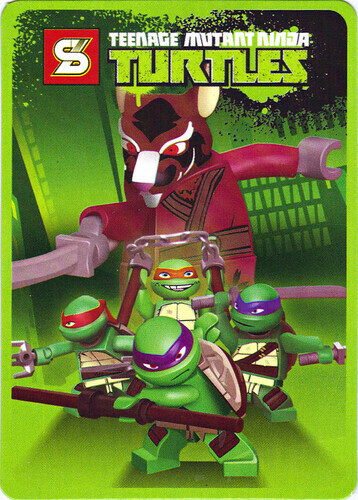 These are the cards i received with the SHREDDER set. 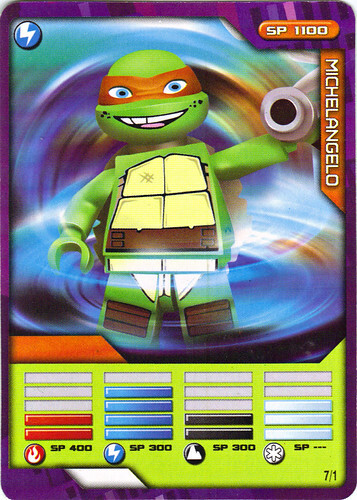 The KRAANG set i received later also came with two different cards. Wider and numbered blades on the S.Y. offering. Slight face variations and bolder lines in the S.Y. mini. 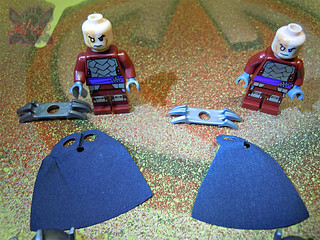 ..softer cloth material is used for the knockoff Shredder cape. 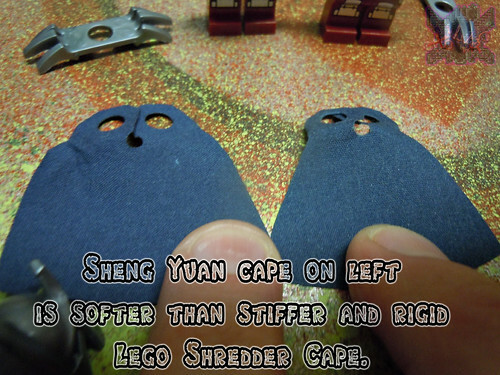 The official cape is a stiffer material. 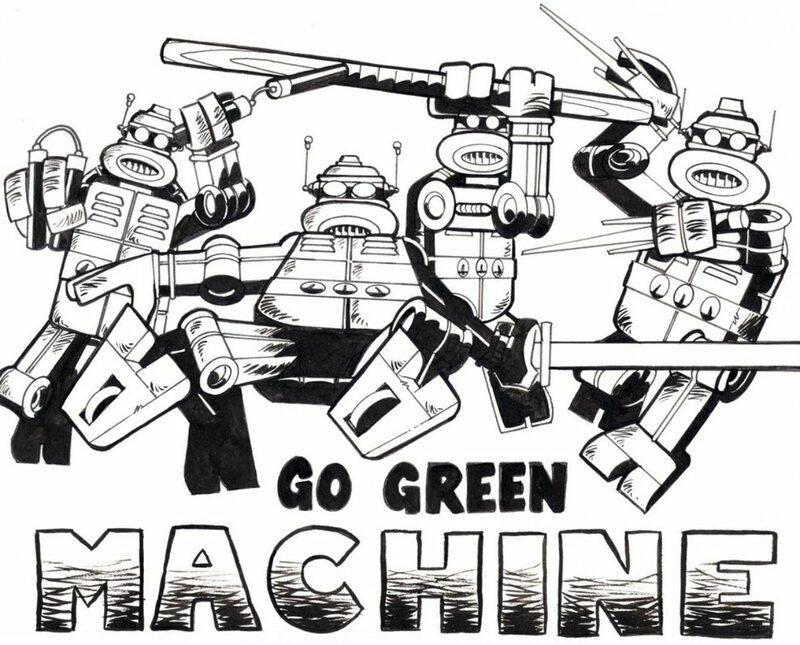 H’mmm ..we’ll save this T.C.R.I. reject on the left for a later post. 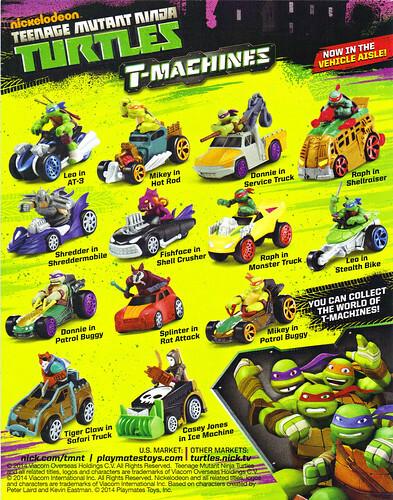 T-MACHINES, hitting stores NOW !! !! 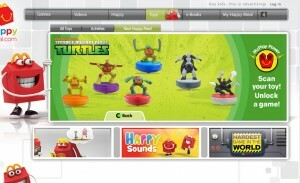 Nick’s Turtles pop back into North American McDonald’s Happy Meal boxes for a 3rd year this time in the form of battle tops next month. 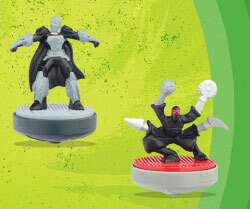 Shredder & a Foot Bot join the line-up as the first villain toys.